Clint Penick is feeling a little “antsy” about his new project — in the excited way one might feel about opening a holiday gift. Penick, an ant aficionado and assistant research professor in the Biomimicry Center at Arizona State University, is offering a rare perspective of the insect kingdom’s plucky picnic pests — by way of pillow. Blending science with art for a practical finish, Penick and his fellow researchers have created a unique line of decorative cushions that reflect their affinity for ants, one he hopes will help raise awareness about the beauty and benefits of the tiny armies that service our ecosystems. That idea to amplify the sculptured patterns of ant exoskeletons was first hatched at North Carolina State University where Penick was working on postdoctoral research. Before bringing the research to ASU’s Biomimicry Center, Penick and two other scientists — Adrian Smith and Rob Dunn — recruited fabric designer Meredith West to translate ant patterns from a database of ant imagery into prints. With prints in hand, they have now produced a line of pillows available through the online company Threadless Artist Shops. Penick says the pillows represent a rare opportunity to access a science-art collaboration as a practical product that anybody can buy. Just in time for the holidays, the pillows are now available for purchase online under the brand name HolotypeA word to describe a single type specimen upon which the description and name of a new species is based., with sales proceeds going to support research efforts at ASU. Holotype pillows inspired by the exoskeleton patterns of the Polyrhachis decora ant species. Val Reyes of the Biomimicry Center at ASU holds Holotype ant pattern pillows. Various ant species and their corresponding patterns. Sample layout for the creation of the ant pattern Polyrhachis decora, contextualized by fabric designer Meredith West. Through the Holotype ant pillow project, Penick and his team hope to raise awareness about the importance of biodiversity in our ecosystems. Pointing to the many benefits that stem from the variety and variability of life on Earth, Penick says protecting biodiversity should be held in the same regard as awareness about climate change and increasing urbanization. While largely overshadowed by more familiar species such as pandas, giraffes or rhinoceroses in the conversation about biodiversity, insects represent half of the two million species that have been described by scientists and are playing a significant role in maintaining and transforming our ecosystems. Penick points to research he has done on ants in dense cities like New York as an example. In New York City’s famed theater district, ants eat the equivalent of 60,000 hot dogs per year in garbage waste that’s dropped on the ground. Along the streets of Broadway, home to New York City’s famed theater district, Penick says ants are eating the equivalent of 60,000 hot dogs per year in garbage waste that’s dropped on the ground. He says ants have huge benefits to the city, cleaning up garbage as they navigate their way around the concrete jungle. And because they dig their nests underground, Penick says ants turn as much or more soil than earthworms, so they are really important in aerating the soil. He also says ants eat a lot of invasive pest species, serving as combatants for trees that might be under attack. Penick says he hopes his research and pillow project will get people to pay attention to the positive aspects of insects and to think about these tiny species as beautiful and beneficial to society. The Holotype ant pillows are ready-made for order online. Identified by ant genus and species in binomial nomenclature, the pillows retail for about $30 each and are available in 16 different patterns and various sizes. Science lovers and ant enthusiasts can also collect the Holotype ant patterns as fine art prints or stretched canvas. Learn more at holotype.threadless.com. Top photo: Swatch samples of the Holotype ant patterns. Photo courtesy Clint Penick. Vaulting beyond velcro, the Biomimicry Center at Arizona State University is seeding new ideas for nature-inspired innovation. Still most widely associated with the invention of velcroEngineer George de Mestral’s invented the hook-and-loop fastener inspired by the burdock plant burrs that stuck on his pants and his dog’s fur while hiking in the Swiss Alps in the 1940s., ASU researchers are walking the talk of biomimicry with a newly renovated office space and a new seed exhibit they hope will capture the imagination of innovators seeking solutions for complex human problems. Titled “Designed to Move: Seeds that Float, Fly or Hitchhike through the Desert Southwest,” the exhibit, opening Oct. 30 in the Design School South Gallery on ASU's Tempe campus is offering viewers an extraordinary look at the beauty of desert seeds as captured through the macro photography lens of Taylor James, an alumni of ASU’s Masters of Fine Arts program. Samaras for example, a winged seedpod produced by a wide range of plants including sugar maples and the slender janusia that grows in the desert, is one such seed that is inspiring innovation. Nicknamed “whirlybird” or “helicopter seed” for its propensity to rotate airborne after detaching from the plant stem, scientists studying the aerodynamic properties of samaras are trying to mimic the seedpod's design and apply its principles to airplane wings and space probes for planetary exploration. Biomimicry research is also delving into the clinging, coiling and self-planting behavior of the seeds produced by the filaree or “stork’s bill” plant. Among other applications, engineers are mimicking the humidity-triggered coiling and uncoiling of filaree awns to create hygrobots: tiny robots whose flexing movements are powered by daily changes in environmental humidity instead of batteries. Fischer said the idea for the seed exhibit came about after a conversation with colleagues from ASU’s Vascular Plant Herbarium in the School of Life Sciences, the School of Art in the Herberger Institute for Design and the Arts and the Desert Botanical Garden in Phoenix during a photography expedition in the desert. The collaboration led to a selection of Arizona seed species that were determined to be visually compelling and had interesting stories about seed dispersal adaptation or application through design or engineering. Fischer said there is talk about possibly taking the seed exhibit on the road after its run at the Design School South Gallery comes to a close. The hope, she said, is to get national parks, natural history museums and herbaria interested in hosting all or part of the show’s modular design. She also hopes the exhibit will prompt people to think about seeds in a completely different way when they come across them in the desert. While biomimicry remains a somewhat vague concept to the general public 20 years after the publication of Janine Benyus’ seminal bookJanine Benyus has authored several books on biomimicry including the widely-referenced "Biomimicry: Innovation Inspired by Nature." on the subject, the engineering of modern innovations such as high-speed bullet trains (inspired by the beak Kingfisher bird), and sharkskin swimsuits (modeled after the dermal denticles on a shark’s skin) illustrate how many biomimicry applications may just be hidden in plain sight. Still, as Dayna Baumeister, director of the Biomimicry Center and co-founder of Biomimicry 3.8, is quick to point out, just mimicking the shape of something in nature or emulating one aspect of an organism does not necessarily make a design biomimetic. Biomimicry, Baumeister said, emulates the design principles of nature to achieve functional similarity. Life’s Principles were consciously applied to the redesign of the office space Baumeister and her team inhabit in the College of Design South building on ASU’s Tempe campus. And, with some help from local design firm Architekton and fabrication firm Nicomia, the team at The Biomimicry Center is now enjoying a more sustainable and resource efficient environment inspired by nature. The Biomimicry Center is offering the public a look at its newly remodeled office at the opening of the macro photography seed exhibit “Designed to Move: Seeds that Float, Fly or Hitchhike through the Desert Southwest” from 5 to 8 p.m. on Tuesday, Oct. 30. The evening will include a Gallery Talk at 6 p.m. and an original soundscape composition by Garth Paine, an acoustic ecologist in ASU’s School of Arts Media and Engineering. Ants, like humans, deal with disease. To deal with the bacteria that cause some of these diseases, some ants produce their own antibiotics. A new comparative study identified some ant species that use powerful antimicrobial agents, but also found that 40 percent of the ant species tested did not appear to produce antibiotics. The research has applications in the search for new antibiotics that could possibly be used in humans. 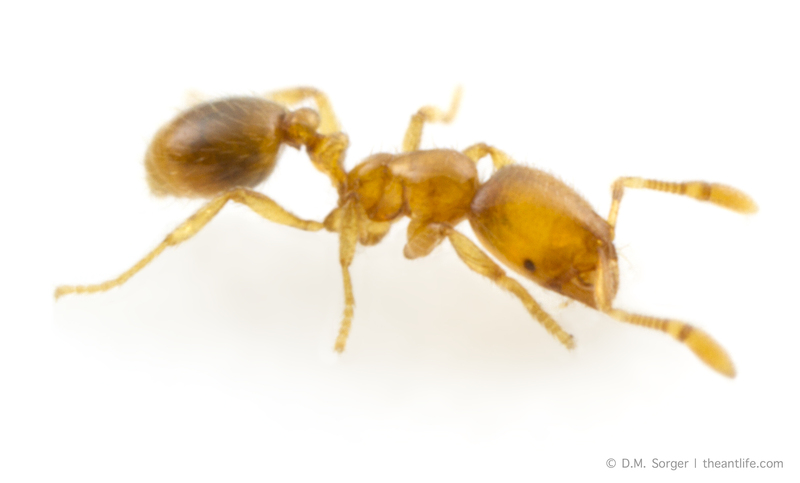 “One species we looked at, the thief ant (Solenopsis molesta), had the most powerful antibiotic effect of any species we tested," said Adrian Smith, co-author of the paper and assistant research professor at North Carolina State University and head of the NC Museum of Natural Sciences’ Evolutionary Biology and Behavior Research Lab. "And until now, no one had even shown that they made use of antimicrobials." For this study, the researchers tested the antimicrobial properties associated with 20 ant species. They did this by using a solvent to remove all of the substances on the surface of each ant’s body. The resulting solution was then introduced to a bacterial slurry. The growth of the bacteria in the slurry was then compared to the growth of bacteria in a control group. If the bacteria in a slurry that contained ant solution grew less than the control group, that meant an antimicrobial agent was at work. For example, the slurry containing thief-ant compounds showed no bacterial growth at all. The researchers found that 12 of the 20 ant species had some sort of antimicrobial agent on their exoskeletons — including some species, like the thief ant, that previously had not been shown to do so. Of those studied, it appears that eight of the ant species do not to make use of antibiotics at all. Or, at least, any antimicrobials on their exoskeletons were ineffective against the bacteria used in the study. That’s because conventional wisdom has long been that most, if not all, ant species carry antimicrobial agents. But this research indicates otherwise. The researchers caution that the study has limitations. For example, the scientists used only one bacterial agent in the tests, and it's not clear how each species would fare against other bacteria. Next, researchers hope to test ant species against different bacteria, determine what is producing the antibiotic effects, and explore other strategies ants may use to defend themselves against bacterial pathogens. The journal Royal Society Open Science published the study on Feb. 7. Authors: Clint A. Penick, Arizona State University; Omar Halawani, Bria Pearson and Adrian A. Smith, North Carolina State University and the North Carolina Museum of Natural Sciences; Stephanie Mathews, Campbell University; Margarita López-Uribe, Pennsylvania State University; and Robert R. Dunn, North Carolina State University and University of Copenhagen. The Triangle Center for Evolutionary Medicine and the National Science Foundation under grants 1523817, 0953390 and 1319293 provided funding for this research. Biomimicry exhibit celebrates nature-inspired design. Biomimicry is an approach to problem-solving that looks at how nature has already done it. In this philosophy, people create a sustainable lifestyle by observing how animals and plants have overcome obstacles in adapting to the environment. A new exhibit at the Tempe Center for the Arts, “Biomimicry: Nature Inspired Design,” explores the connections between this philosophy and art. And because Arizona State University is a leader in the field of biomimicry, several faculty members and alumni are involved in the show, which also includes events to inspire community members. The exhibit, which runs through Aug. 26 in the gallery, includes beautiful pieces that evoke the lovely but practical aspects of the natural world — butterfly wings, a snake’s spine, seeds that float through the air on fibers. Biomimicry is a shift from “people-centered” design to “life-centered” design, according to Prasad BoradkarBoradkar, a professor of industrial design in the Herberger Institute for Design and the Arts, also is director of InnovationSpace at ASU., co-director of the Biomimicry Center at ASU. “Nature has been evolving for billions of years, and organisms have learned to adapt to their environment and cohabit with other organisms in their ecosystems,” said Boradkar, who is currently working on a project with Google in Mountainview, California. Artist Alexandra Bowers uses a wood-burning tool to etch the image of a feather onto a wooden box. A sculpture titled "prehistbird," by artist Jose Benavides, is on display at the "Biomimicry" exhibit at Tempe Center for the Arts. Benavides earned a Master of Fine Arts degree from ASU. The sculpture "Origin Insertion I II III" is inspired by the spine of a snake. Artist Emily Longbrake used ceramic spheres to solve the problem of how to make the piece collapsible for shipping. "Avienne," by artist Alan Bur Johnson, who trained in biology, is inspired by butterfly wings. Students in the Biomimicry Center work across disciplines to find solutions, Boradkar said. “The impact of design and manufacturing of new products doesn’t affect only humans. It affects all species on the planet. So why don’t we learn from all species on the planet?” he said. Many everyday products and technologies have been inspired by biomimicry, such as hook-and-loop closures, also known as VelcroThe Velcro Co. is one of the sponsors of the exhibit, along with the following ASU units: the Biomimicry Center, the LeRoy Eyring Center for Solid State Science, the Julie Ann Wrigley Global Institute of Sustainability and the Natural History Collection in the School of Life Sciences.. That was created in the 1960s when a scientist’s dog kept getting covered in burrs. Frustrated, the scientist looked at the seeds’ “grippers” under a microscope and was inspired to invent the fastening product. The shape of moth wings have led to solar-power designs, and the echolocation abilities of sea mammals created the basis of radar. More recently, the slick swimsuits worn by the U.S. swim team in the 2008 Olympics were based on the composition of shark skin. They were later banned for giving an unfair advantage. And an ASU-designed robot used a sea turtle's flippers as inspiration for a way to navigate different types of terrain. The principles of nature have shaped not only what the Tempe exhibit’s artworks look like, but how they were created as well, according to Michelle Dock, gallery director. “What we found with a lot of artists is that they’re inherently doing those sorts of things with this discipline that’s kind of new and also kind of old,” she said. For example, artist Emily Longbrake incorporated the structure of a snake’s spine into her wood-and-string sculpture on display in the exhibit. When faced with the challenge of how to efficiently ship her artworks, she studied the ball-and-socket anatomy of a slithering snake, then incorporated ceramic balls into her design, which allows it to be flattened. Damon McIntyre, a wood sculptor and instructor in the School of Art at ASU, has several pieces in the exhibit that he created out of some old pecan trees that were cut down on campus. The concept of biomimicry comes in with a table that has an asymmetric base. “He’s emulating the root system of a tree to strengthen the legs,” Dock said. The program includes three artists in residence, photographer Nissa Kubly, sculptor Jose Benavides and wood-burning artist Alexandra Bowers, who are working with ASU faculty members in the sciences to broaden their understanding of how nature informs design. Benavides and Bowers both received degrees from ASU. “This is an in-depth study for them to take their work in another direction,” Dock said of the collaboration. The three are working in pop-up studios in the gallery through July 21. • Family Arts and Sciences workshops every Saturday from noon to 2 p.m. The July 15 session will feature faculty from the Julie Ann Wrigley Global Institute of Sustainability at ASU, and July 22 will be “Beyond the Collection Box” with ASU’s Natural History Collections. • Satellite workshops at the Edna Vihel Center for the Arts in Tempe on June 24 and July 15 with artists and Kyra Galanis, who has a degree in biomimicry from ASU. • Bee Hive Café for Teens from 4 to 7 p.m. June 16 and June 23 will feature free brainstorming sessions for art groups, science clubs and robotics teams, with free coffee. Boradkar will speak to the teens at 4:30 p.m. June 23. • Dayna Baumeister, co-founder and co-director of the Biomimicry Institute at ASU, will give a free lecture at 7 p.m. Aug. 24. Boradkar said he’s excited to discuss biomimicry with young people, and that outreach is an important part of the Biomimicry Center’s mission. “We approach it by talking about the concept of ‘biophilia’ — ‘bio’ is life and ‘philia’ is affection,” he said. Click here for details and information on how to register for the satellite workshops.